I was driving along in my car near Alexandria and I saw a man in flannel shirt carrying a safety cone. I wasn’t paying close enough attention so I didn’t notice him trying to wave me over until I had passed and caught sight of him in my rear view mirror. Later,, on my way home, I saw him again. This time, as we waved me in, I followed his instruction pulled off the road, parked my car, and walked down into what appeared to be a gravel parking area with a charming rock wall that overlooked a lake. It was a nice area, bucolic really, and I didn’t feel the least bit frightened. There was one other person waiting in this area. Within a few minutes, others arrived who had also been directed into this area. Eventually, there would be roughly one hundred of us. There we were, waiting together, but for what. Many of us had smartphones or tablets and nothing regarding any sort of incident in the Alexandria was appearing on feeds or news sites. No law enforcement ever drove by, we never heard sirens. It occurred to me that the man directing us wore no uniform and didn’t seem to be in contact with anyone else. He had no phone, not even a walkie talkie. Only a flannel shirt and an orange safety cone. More and more people started to show up. We visited only minimally, engaged in less than small talk. Some of the conversations were simply peculiar. My alarm went off. I felt a sense of relief. It was if I couldn’t recognize the pending doom, the emanate danger, the fatality or what was to come until my eyes were open and I was awake. It occurred to me that I had followed the directions of someone with no apparent authority. Someone who led me to a secluded space. And not just me, many followed. What was the intent of the man in a flannel shirt with the orange safety cone? Were we all in danger? Were we going to be kidnapped, or killed? I began thinking about my day and what could have contributed to this strange and thought provoking dream. Or perhaps it was a Kafkaesque dream.? I had recently experience, what I refer to as a literary coincidence. I had been reading Kafka's “The Trial.” And then one day Webster’s word of the day is Kafkaesque: of, relating to, or suggestive of Franz Kafka or his writings; especially: having a nightmarishly complex, bizarre, or illogical quality. And to this literary coincidence there is a third piece, I am reading the New York Times Book Review, (a simple weekly pleasure) and the Israeli author Amos Oz if featured in the section “By the Book.” This is a section of the review where authors talk about writers and books they like, and one of the authors he references is, of course, Kafka (literary coincidence). It certainly was a Kafkaesque dream. I believe it was also fed by my concern earlier in the day of stranger abduction, and how I had recently heard or read something about never let someone trying to abduct you take you to the next location, fight scream, do whatever you can to avoid being relocated. In this dream, we all went so willingly. So it occurs to me that there is even a bigger message in all of this about, who we trust, where they lead us, what are their motives, and why are people so willing to follow? I have registered for "23 Things" a program to help me maximize my use of my mobile devices. I am always up for learning something new. 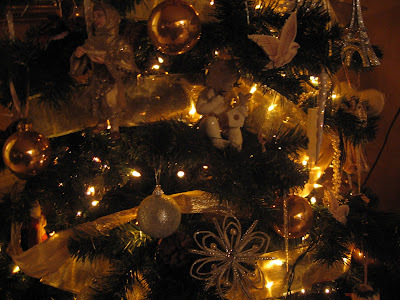 Have you ever had a Christmastime mishap? Or maybe in the attempt to create really special memories or a family tradition things go really badly and that new special memory may actually require your loved ones to get therapy in future? By now I am sure you can guess that all of the above applies to me and my family. Let’s start with the making of rosettes. I love rosettes and no one in my family makes rosettes (now I know why) so I decided that I needed to take that task on myself, I mean really how hard could it be? Off I go to purchase the little rosette maker and the ingredients to make them. I should have been leery as soon as I noticed I need to heat grease, that never goes well for me and this time was no exception. With a batter or dough of sorts and frying pan sizzling with hot grease we dipped the rosette thing-a-ma-gig into the batter and then into the frying pan and everything just seemed to fall apart and become a big clump of gooey mush. I didn’t give up right away I kept at it until the house was filled with smoke and smelled like a greasy dinner. Eventually I was yelling, Kent was looking for a fire extinguisher and both kids were in tears. I have never tried to make a rosette since. For years I kept that rosette maker in my drawer just in case I got my nerve up to try again. One day I just couldn’t take having it in the kitchen drawer sneering at me and daring me to try again so I donated it to the thrift store so that some other family could be tortured by trying to make rosettes. When I eat a rosette you better believe I savor every bite. I tried my hand at making divinity once, again something I love. Along with hot grease anything that requires me to determine a soft ball or hard ball stage or take the temperature of something boing on my stove provesto be just too much for me. I was making the divinity to bring to a Christmas gathering I was attending. Liquid, that’s all I really have to say. My divinity was liquid; I poured it into the decorative tin, brought it to the party and suggested serving it with a straw. Lefse; don’t you wish I had a story for making lefes? But I’m no fool I’ve never even attempted. I am resolved to the fact that some of us can make Scandinavian treats and others of us can just eat them. Trust me, it could be worse. This is my letter to the editor in support of our school's upcoming referendum. I am proud to be voting YES for West Central Area School’s referendum in the upcoming election. I understand the direct correlation between investing in a quality education and building a strong local economy. When attracting people to our rural communities we need to have a global view and rely on what research has been showing us for a number of years. The future does not lay in industry; building a new factory and paying people substandard wages is a regressive initiative at best; it is unsustainable and will result in no real economic growth. Real economic growth is going to be in attracting the creative class and gold collar workers to our community. It is no longer jobs that attract people to a community, it is a community that attracts people and those people bring or create jobs. Over the past few years I have meet a number of new families who have moved into our community. Upon asking them what brought them here, I found it was our quaint little town, the sense of community, the beauty of the region, all of the amenities that were available in our small town and overwhelmingly, our school. Some of these people work from home so they could choose to live anywhere but they choose here. In essence it was our infrastructure that attracted them and not in the traditional sense of the word. Our infrastructure includes core services, such as utilities, streets, and telecommunications (all of which are top notch), but it goes beyond that. The creative class and gold collar workers are looking for value added services such as parks, trails, charm, libraries, cultural activities and quality schools. This group of people is not going to settle for average or hum drum, and they don’t have to because they can telecommute and are willing to travel to work as long as where they live provides them and their families with the amenities they are looking for. They relocate to the community of their dreams, so to speak. I am also a bit perplexed by the referendum neigh sayers obsession with teacher’s salaries. In no way do I think our teachers are overpaid, I have reviewed the state’s teacher’s pay statistics at the Minnesota department of Education’s website and you can too. What might be more pertinent to compare is what the average person with a four year degree or master’s degree is paid. Trust me; teachers are at the low end of that scale. Since when it is our goal to under pay teachers? I want our local educators to be well compensated for the outstanding and eminently important and essential work they do. I believe that the work educators do is paramount to the growth, sustainability and economic health of our community. The dedication of our local teachers is par excellence. Drive by the local elementary school one evening or weekend and notice the cars out front that belong to teachers who are spending their own, unpaid time working in the classroom to get done what the normal work week doesn’t allow for. I also know personally that many teachers use their own money to supplement resources and materials for their classrooms in order to enhance the experience of their students. We have outstanding teachers who deserve fair pay for their work. Educational funding in the state of Minnesota has changed and the responsibility has been put into the hands of local residents. The state is in essence giving us the opportunity to say “Yes, we value and are willing to support quality education.” Or we can devastate our local schools which will eventually cripple our local economies and send our small towns into a downward spiral that we can’t work our way out of”. I too, like most people I know, live on a fixed income. I wanted to buy a new pair of shoes, but instead I chose to have this letter published in our local paper. My income may be fixed, but my priorities are straight. While some people hop on that, “No new taxes” mantra . I don’t like to have a blanket response to issues. I like to do some research and dig into things a bit. As it turns out, with this referendum the return on our tax investment is amazingly high. It is what I would consider too good of a deal to pass up. Please join me in investing in the future by voting yes. disagree. When I go out to eat I want to feel like the people preparing and serving the food have pride in the product; starting with the ingredients, moving on the to preparation and finally the delivery; the way the plate is set down on my table. Now, not all restaurants, diners or cafes lend themselves to the same experience. I am looking for something completely different when I go into Monte's in Fargo or the Viking in Fergus Falls; both by the way places I love. There are a few things in life that I won't compromise on; one being half & half for my coffee~ I won't touch those "needs no refrigeration" things left on the table all day~ no way, that is not going in my coffee. Second, I only want real maple syrup. I do not ever want corn syrup with maple flavoring on my pancakes or waffles. I implore you to only use real maple syrup. As a matter of fact get up now and look in your pantry for your bottle maple syrup (I'm using the term loosely) and read the ingredients. shocked? Disappointed? I know I was. They really shouldn't even be able to call it maple syrup~ it's a lie. Recently I was out eating (a slightly below average experience) I ordered French toast (it was marginal at best) the waitress brought a bottle of store brand syrup to our table ~ huge faux pas~ never put the jug of anything on the table put it in a serving piece~ I might lightening up on this if you were serving REAL, LOCALLY MADE, maple syrup~ it might be nice to see that little bottle and confirm that it is indeed real. Any way this ugly, solid, cheap plastic bottle of store brand "maple syrup" is set on the table and if that isn't bad enough the bottle brags, "made with 2% real maple syrup." Really? Like that's something to brag about? Trust me, I'm not putting that on my French toast. Real maple syrup is going to cost more than a cheap substitute. In my humble opinion that is probably because maple syrup does not receive the farm subsidies that corn does~ go figure. 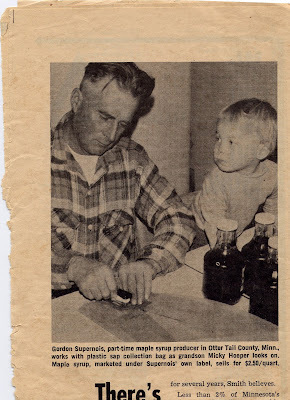 But here is the story on real maple syrup. The Sugar Maple is a tree and in the spring when the days get warm but the nights still often return to freezing temperatures, the sap, which is stored as starch in the trees roots during the winter begins to run This is refereed to the sugaring season or sugaring off. Those harvesting the sap use a technique such as cutting a V shape or small hole into the tree and inserting a tube from which you hang a bucket and the sap slowing runs into the bucket. The harvester returns to the trees and gathers the sap that has collected in the buckets. It is beautiful, and the temperature is brisk it is this crisp time of spring before everything gets all muddy. 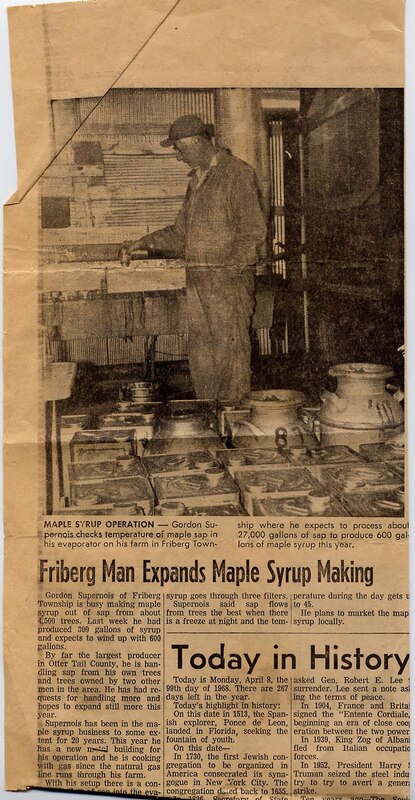 My Grandfather, Gordon Supernois, used to make maple syrup and I remember collecting buckets of sap with the my dad, Gary. I never much followed what happened in that syrup making shed at the end of the driveway, it was warm and there a was glow from the heat of cooking sap which was to become syrup. I knew the end results tasted great and that people from all over came to puchase the locally produced syrup. So there you have it, take some pride in what you put into your body and use real maple syrup. When you are out eating ask if they have real maple syrup, insist on it. You can buy real maple syrup at Dean's Super Valu in Elbow Lake as well as Meadow Farm Foods in Fergus Falls. 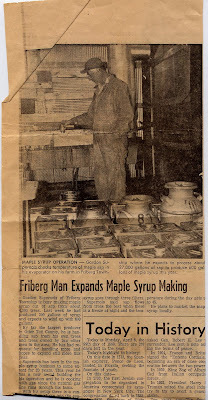 Cafe 116 in Fergus Falls uses real maple syrup. I call this little blog "Dwellings" because I think were we dwell tells a bit about us to say the least. I don't think that our homes or belongings define us, but when given the opportunity to make purchase or spend time in a place or at a place perhaps there is something to be learned. The books we read, the movies we watch the organizations we belong are all a bit of a link to who we are, who we wish were or maybe who we hope to become. The other day I got the mail and there was a magazine called "dewll" (all small letters). My first thought was that it was a mistake, I don't subscribe to "dwell." According to the label and the fact that the magazine keeps arriving in my mailbox, I must subscribe to "dwell" http://www.dwell.com/ I concede, I somehow, without realizing it subscribe to "dwell." It's a nice magazine and I've read some really good articles, I like the design element, but truth be told I'm more of a "Traditional Home" magazine person or "Martha Stewart Living" or "Victoria." My house is a mixture of stuff much gathered up along the way so to speak and I love traditional elements with a little funk thrown in here and there (I mean we have to keep it interesting). 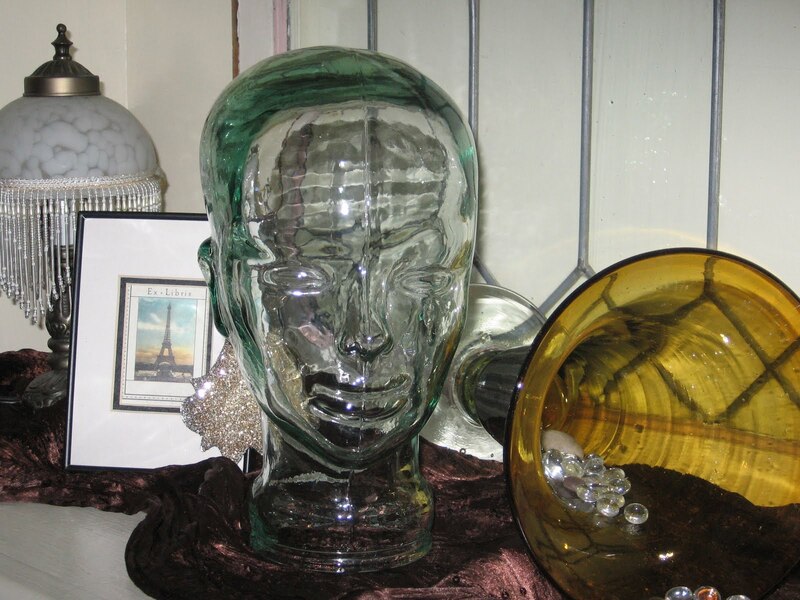 Like my glass head. One year while shopping at Pier One with my grandma Gert, she asked if there was anything there I would like for Christmas. 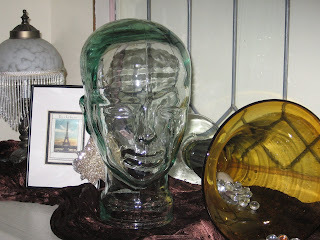 I responded, "Yes indeed there was, that glass head." That is exactly what she gave me for Christmas, probably more than 12 years ago. 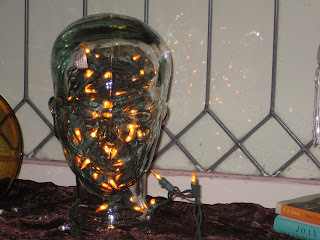 The head, in all of its simplicity is really diverse. Sometimes I fill it with lights and call it headlights, the head is kind of like possibility. Book to read: just finished reading two kids books, one was a reread of a childhood favorite~ "The Cricket in Times Square" by George Sheldon actually I listened to the audio and the reader was fabulous. The other book was "The Magician's Elephant" by Kate DiCamillo and it was beautiful. I am going to read a grown up book soon. Artist: Calvin DeRuyter http://www.calsportfolio.net/ I absolutely love his work~ it just sticks in my head. Music ~ Well how about a little Christine Rosholt http://www.christinerosholt.com/ who will be performing at the Barrett Pavilion on Saturday, September 18th. Television: I simply only watch "Mad Men."